Karan Madhok is a second-year MFA student at the American University in Washington, DC. 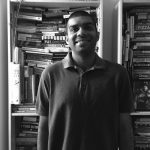 He was born in Varanasi, India and has been a sportswriter for the past nine years, with his work appearing for NBA India, SLAM Magazine, The Times of India, and more. This is his first fiction piece to be published in print.